SCIENTIFIC NAMES: Order Coleoptera, family Coccinellidae. Twospotted Lady Beetle - Adalia bipunctata. Ninespotted Lady Beetle - Coccinella novemnotata. Twicestabbed Lady Beetle - Chilocorus stigma. Convergent Lady Beetle - Hippodamia convergens. Ashygray Lady Beetle - Olla abdominalis. Asian Lady Beetle - Harmonia axyridis. 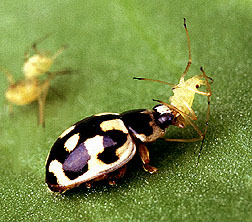 Lady beetle eating aphid. Photo by Scott Bauer, Agriculture Research Service. INSIGHT: Ladybugs are the most popular and most universally known of all the beneficial insects. There are several hundred species in North America, and all are beneficial. The most common native varieties are orange with black spots, gray with black spots, and black with two red spots. The black and gray varieties are arboreal and usually seen in trees. 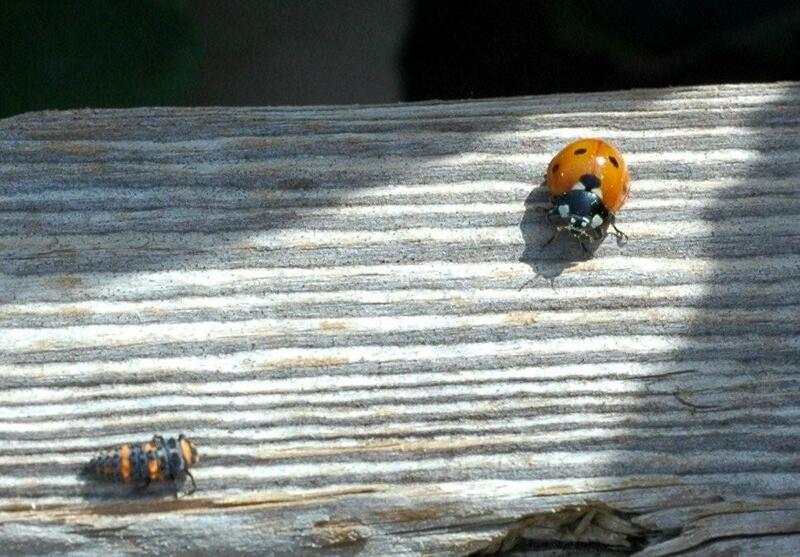 All ladybugs should be protected. The Hippodamia convergens - orange with black spots and converging white lines on the pronotum (shield behind the head)--is the most available commercially.